This is the 162nd in my series of Forgotten Books. One of my favorite books from last year was Jackaby by William Ritter, a young adult novel of weird happenings. R. F. Jackaby is an eccentric supernatural detective living in New Fiddleham, New England. He sees things that go bump in the night as well as in the daytime. Through extraordinary circumstances, he acquires an assistant/protégé, a young independent minded woman named Abigail Rook who was not content to sit at home while her parents looked for a suitable husband for her. When she was turned down for the position of assistant to her father in a paleological dig, she left England in disguise and world her way to America. As Jackaby’s assistant, they solved a vexing and complex murder involving the supernatural. 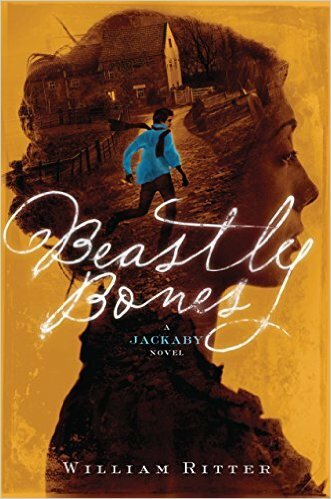 I enjoyed the first book thoroughly and immediately ordered the second one, Beastly Bones, to be delivered upon publication. It came the other day and I began to delve. The characters lived again as they had last year. Jackaby was still an odd mix of Sherlock Holmes, John Silence and Carnacki. Abigail was headstrong and plucky. The house where Jackaby lives is filled with many things. There is the ghost of the owner Jenny Cavanaugh, who is Abigail’s closest friend, since Jackaby has some less-than-sociable tendencies. Jenny has been murdered and the murder has never been solved. Jackaby has vowed to do it when Jenny wants him to but that time has not yet come. The case begins with a woman who is upset that her cat had kittens and then turned into a fish. The kittens are far from normal. They are chameleomorphs, animals who take on the form and characteristics of their food source. The mother cat has been fed fish, ergo she begins to change. Jackaby is concerned because these are seriously dangerous beasties, and he has plans to turn them into fish and then feed them insects within a confined area. As trapped insects, they are not nearly as tough. They attract the attention of Jackaby’s friend Hank Hudson, a trapper of oddities and an old friend. He is hunting something big and odd in a neighboring county. While trying to determine where the dangerous kittens came from, they are asked to check out the mysterious death of a farm wife nearby. Her husband has found dinosaur bones and is trying to get some help and publicity. This brings in two rival paleontologists who hate each other. Then bones start to turn up missing and Jackaby becomes sure that the bones represent a mystical beast that should not be there. And then the strange footprints appear. It was a fun story and I got suckered deep into it, so I missed a few of the vital clues. But, in the end, I was very satisfied and horrified that it will again be a long time before the next book is available. The characters are fun, even Jackaby’s former assistant, who is now a duck. The ghost is likable most of the time. The policeman, Charlie Barker from the first book, provides a suitable romantic interest for Abigail, though they are both incredibly shy and inexperienced, much like the intended audience for this volume. I can heartily recommend these titles. There’s also a short story available for Kindle that I have not yet read, but the weekend is coming soon. Check it out. This entry was posted in Books, Forgotten Book and tagged Beastly Bones, chameleomorphs, Forgotten Books, Ghosts, Jackaby, Jenny Cavanaugh, Supernatural detectives, William Ritter, YA fiction, Young Adult Fiction by sanford. Bookmark the permalink. I’m ordering JACKABY and BEASTLY BONE right now! Sound like my kind of books! excellent review! Ah, to feel yout’ful and full of inexperienced shyness again. Beastly Bones sounds fun, and your review has suckered me to give it a try. Sounds wonderful, Scott, though perhaps just a tad too supernatural for my taste. Or maybe not. I’ll see if the library has the first book.